My tribute to Lynda Carter's ultimate Wonder Woman, who has influenced my life in so many ways since I was three. I haven't drawn her in quite awhile, and it felt incredible to do this one. I captured what I've been working at capturing for years. This was finished a couple months ago and the time is right to finally share it. In some very exciting news, I'm looking forward to co-hosting Satin Tights: A Wonder Woman Podcast with Paul K. Bisson and many very special guests, beginning later this summer. It's all about Lynda's Wonder Woman TV series, one episode at a time. It'll be great to really explore this series (celebrating its 40th year!) and this character's impact, and have quite a bit of fun doing it! Thanks to Crew Magazine for this lovely surprise about Oh, My Stars! and my illustrations! 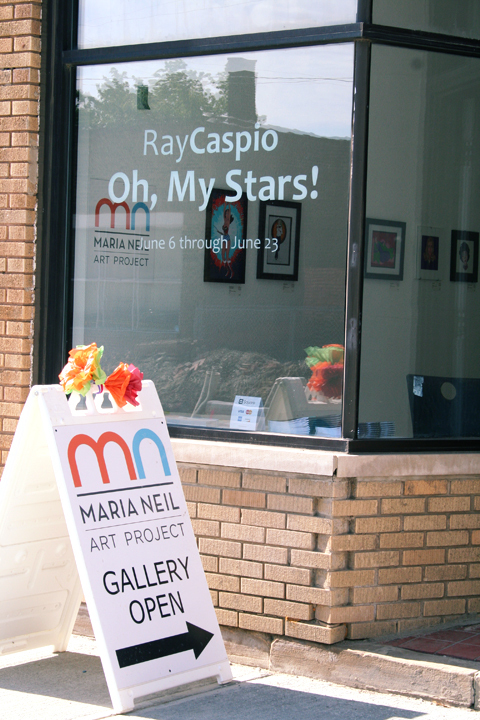 "It’s great that Caspio has made it cool for younger gay men to access the language, style, and influence these ladies had on previous generations…"
Thank you so much to everyone who came out to celebrate the opening of Oh, My Stars! and to those of you who will be filling your homes with new art! I was thrilled to hear the vivid memories – and to be surrounded by the joy and laughter – that my work brought up. The exhibit closes Sunday. I'll be there Saturday from Noon-2:00ish hanging out. I hope to see you there...and if you see something you want to take home: even better! Bewitched characters, Wonder Woman, The Golden Girls, Lucy, and many other pop icons from the '60s, '70s, and '80s await!